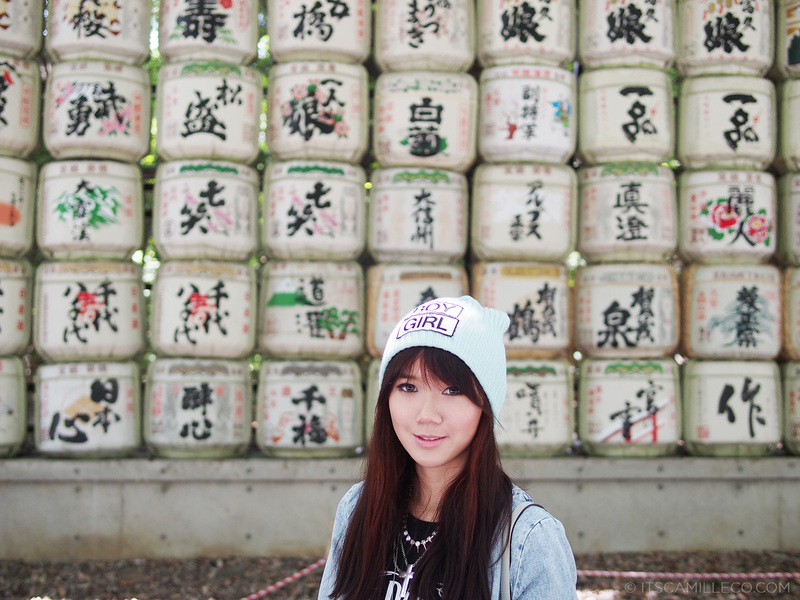 Another day in Tokyo, another day of touring around the city’s main attractions. 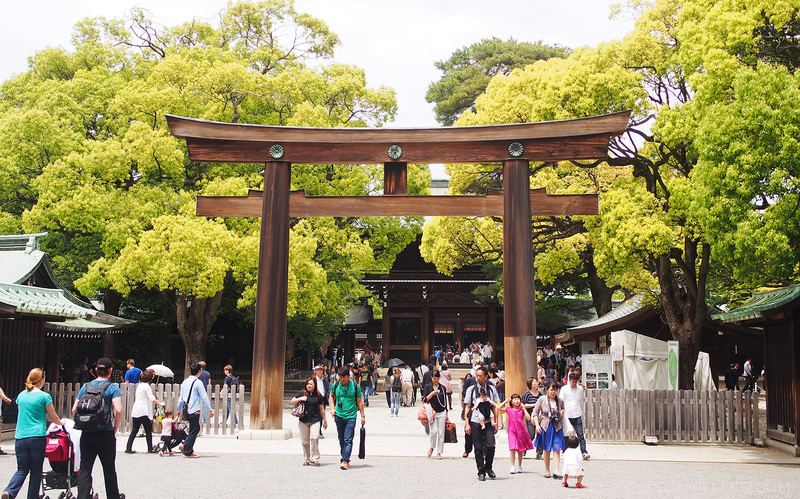 This time, it’s the Meiji Shrine, Tokyo’s most famous Shinto shrine. 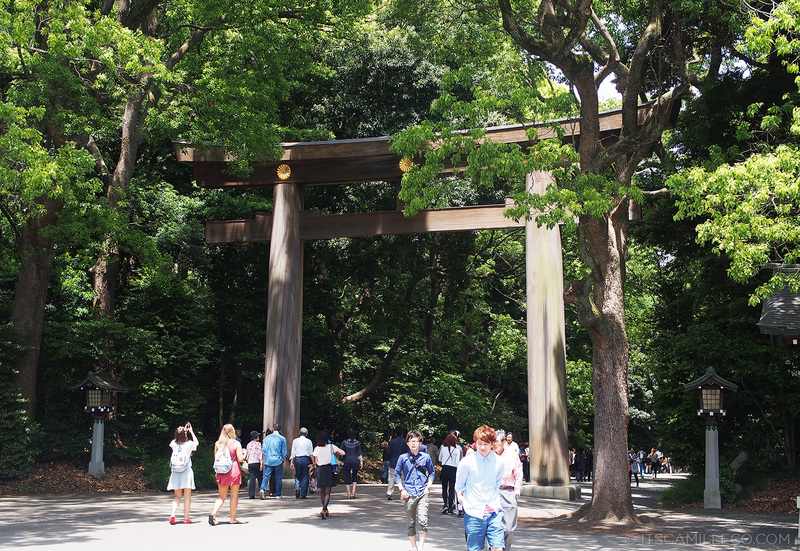 Once you see this huge torii gate, it means you’re about to enter the vast property leading to the shrine. 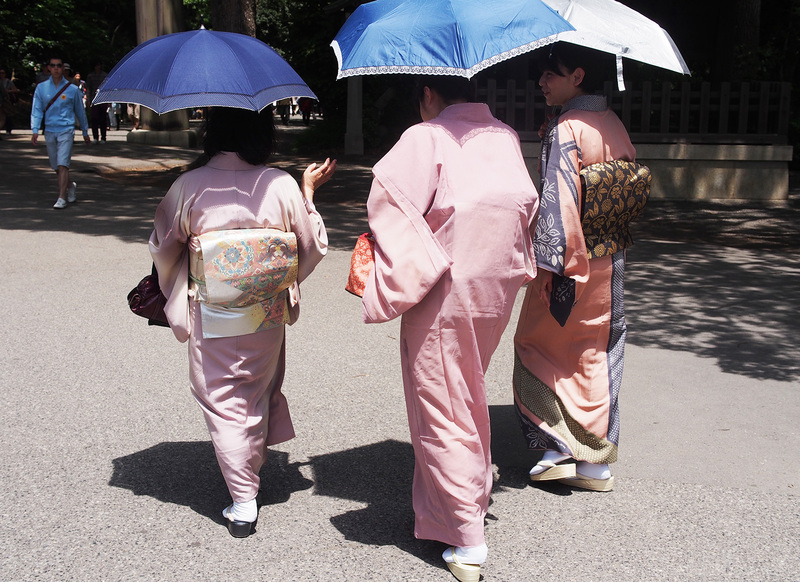 You’ll see a lot of women dressed in traditional kimonos here. Even though I’ve seen them before, I still can’t help but take ninja photos of them. Another one! 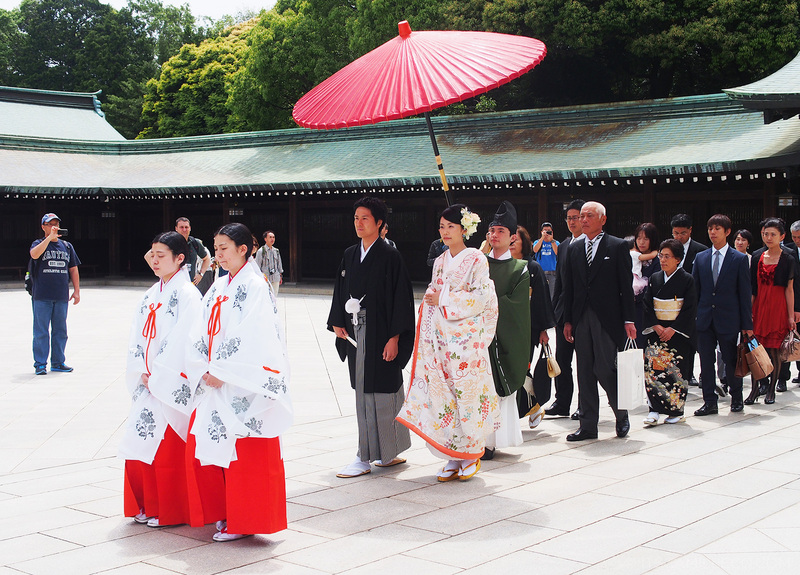 I’m really so amazed that the Japanese are able to keep this tradition alive. 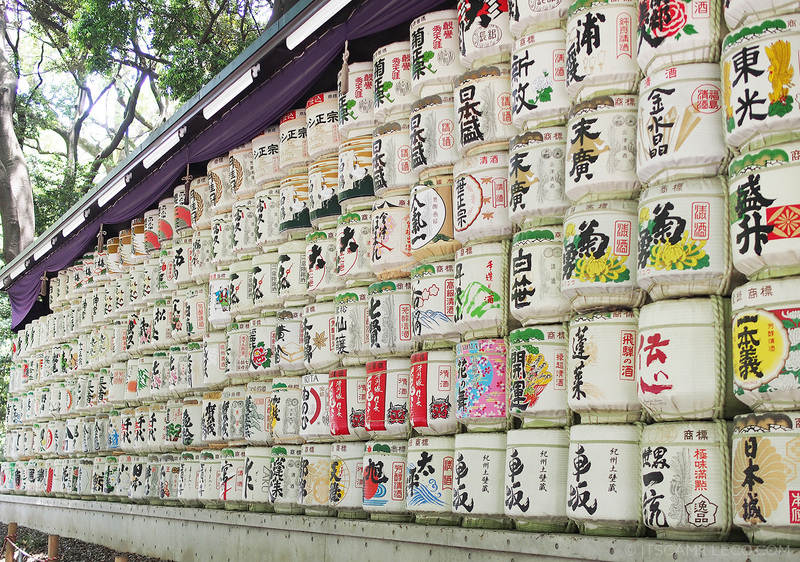 These are barrels of sake wrapped in straw. 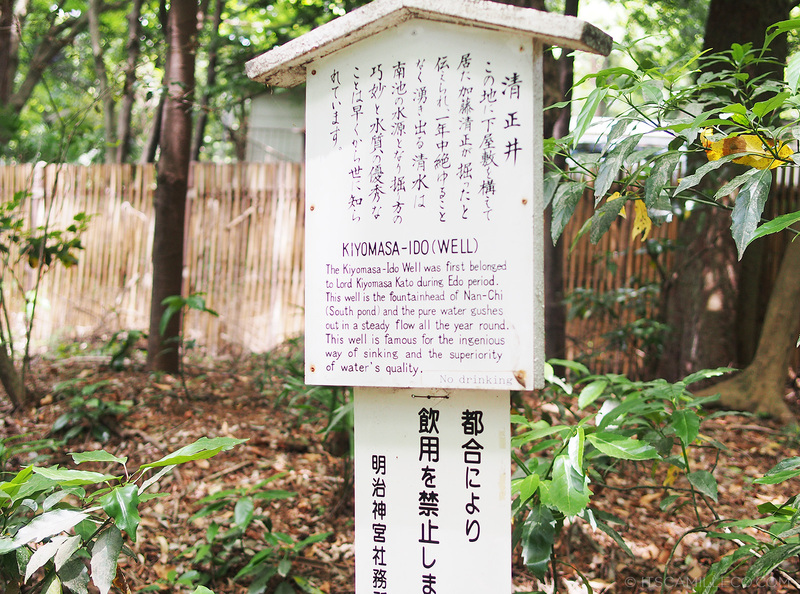 Every year, the members of the Meiji Jingu Nationwide Sake Brewers Association offer sake barrels to Emperor Meiji and his wife, Empress Shogun, whose spirits are both enshrined here. 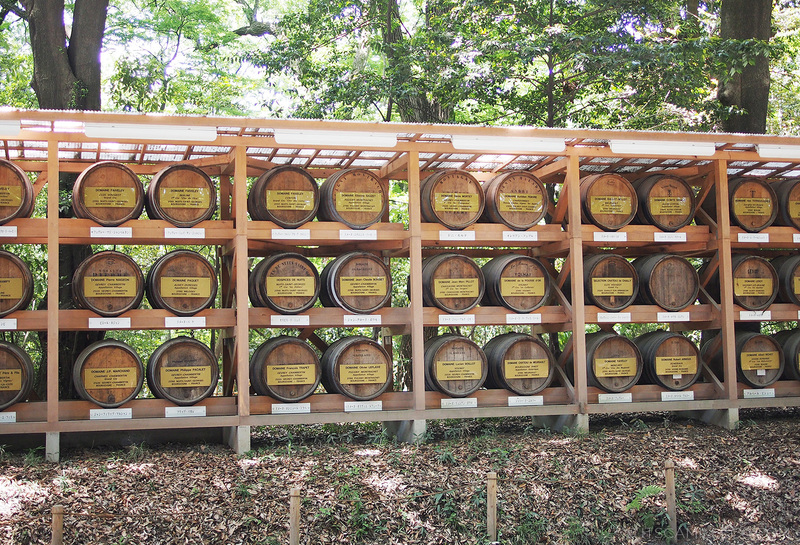 Foreign guests offer barrels of wine like these. 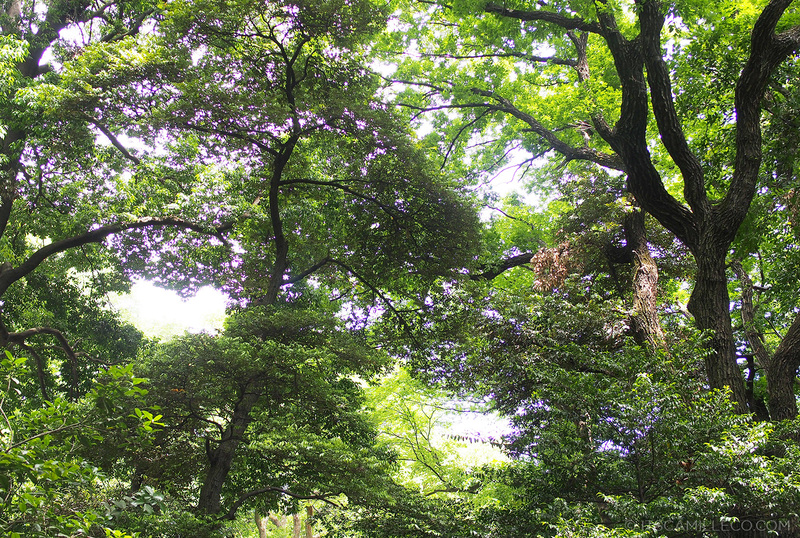 The first tourist spot you’ll see around this property is the Meiji Jingu Garden. 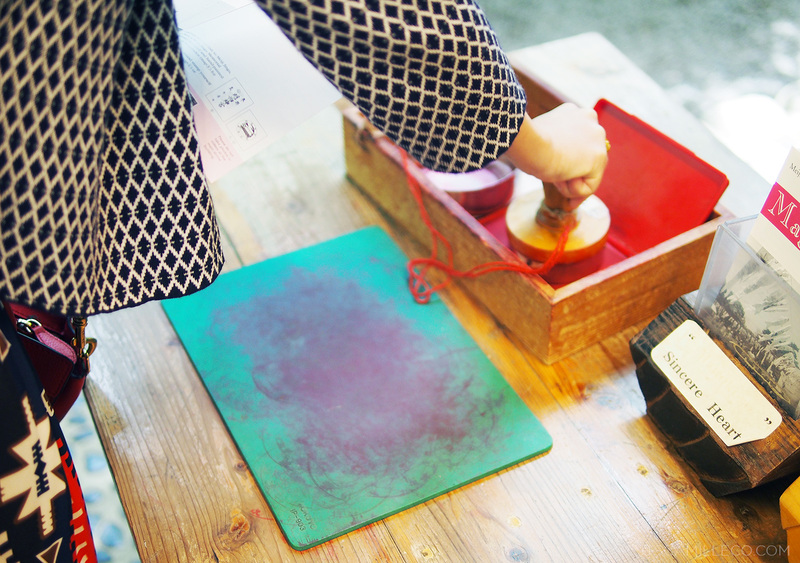 Upon entering the garden, visitors can use this stamp to create their own souvenirs. 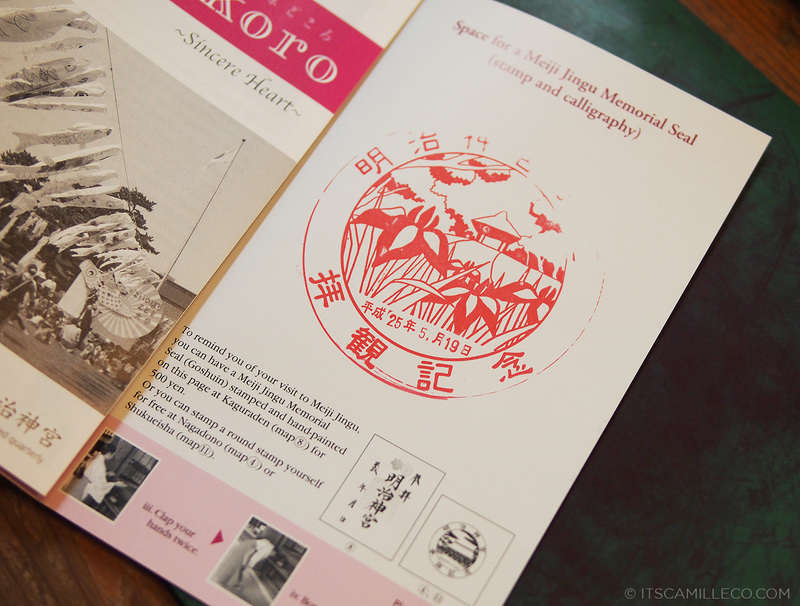 You can stamp it on this free brochure/map of the entire property. 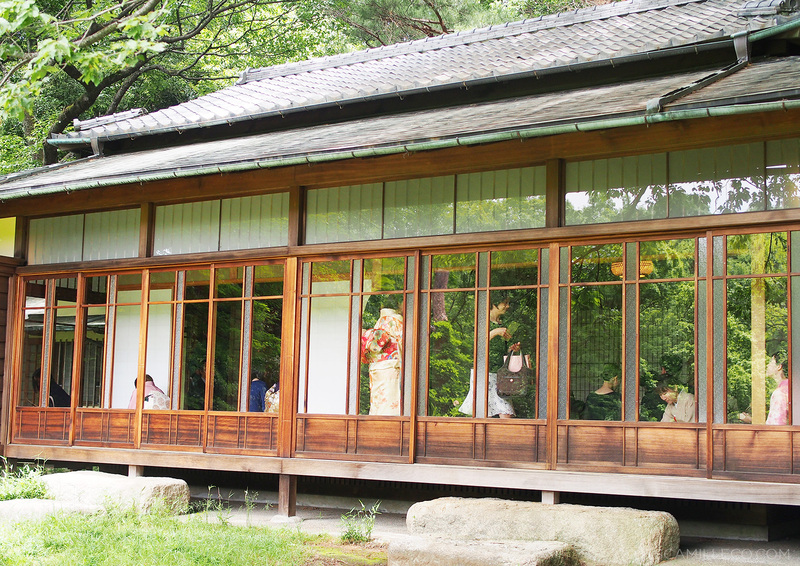 This is the tea house. 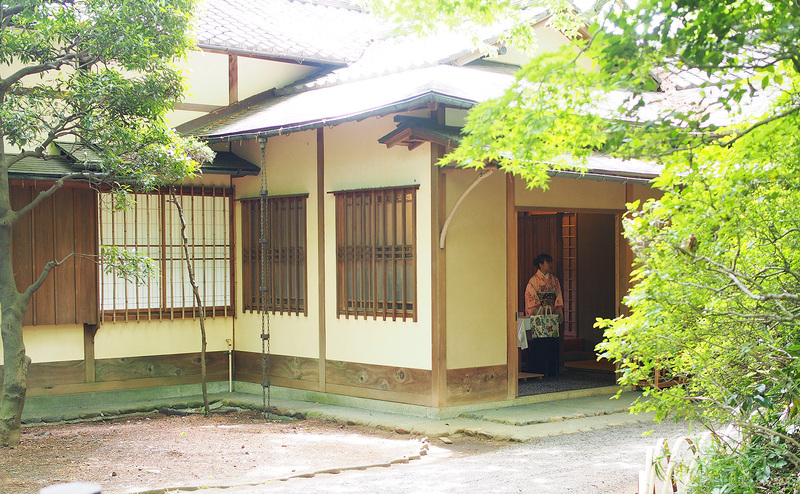 A lot of the women dressed in traditional Kimono were heading to this place when we passed by. 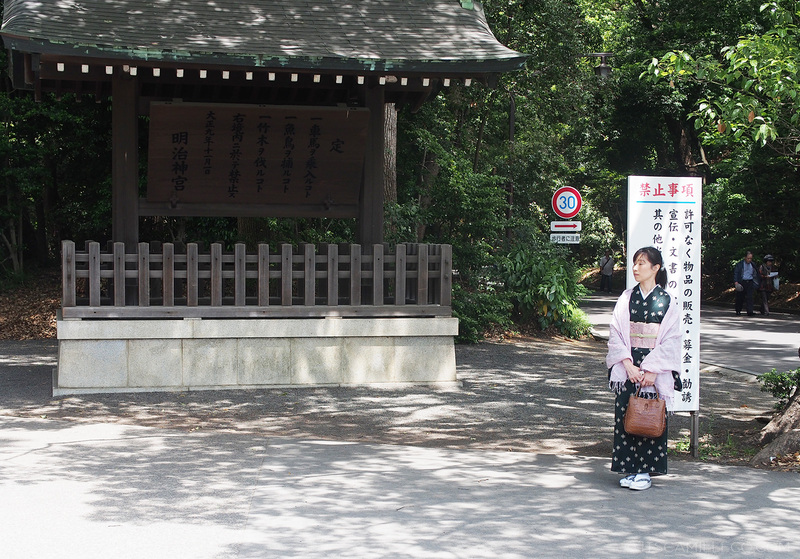 I think they were having some sort of tea ceremony. I told you, I can’t help but stalk them. LOL! While most of the tourists were taking the scenery in, I decided to make the most out of it by taking my outfit shots here. Quick break from the touristy photos! Time to show you my outfit. Finally, my sister mustered up the courage to ask if these ladies would allow us to take photos with them. I’m so happy they graciously said yes! 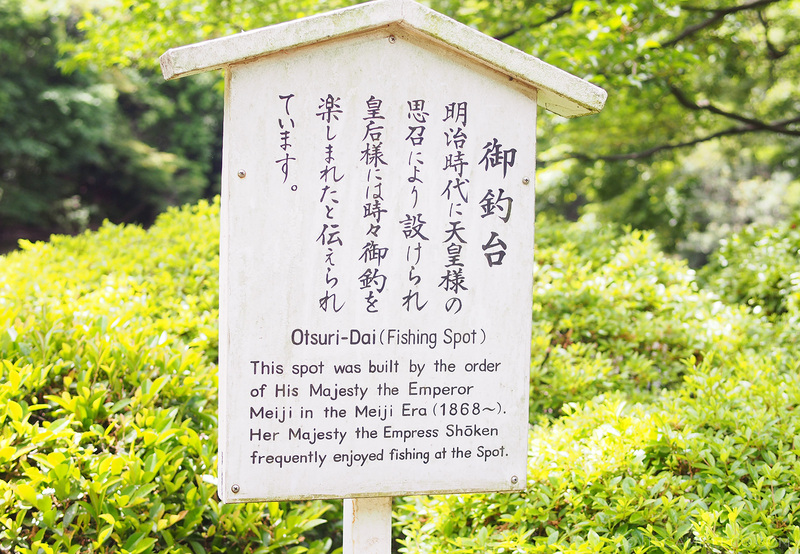 This is the Kiyomasa-Ido well. A lot of people were lining up to wash their hands here. I guess it’s supposed to bring good luck so my sister, mom and I tried it as well. Aren’t my sister and I sweet? We always walk hand in hand. It’s a habit of ours. Would you believe my sister is already 27 years old? She looks sweet sixteen!! 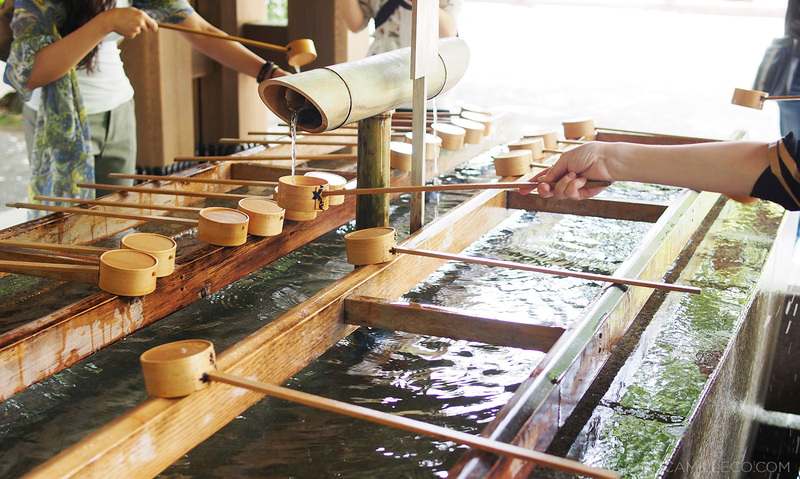 This is the cleansing station where you’re supposed to purify your hands and mouth. 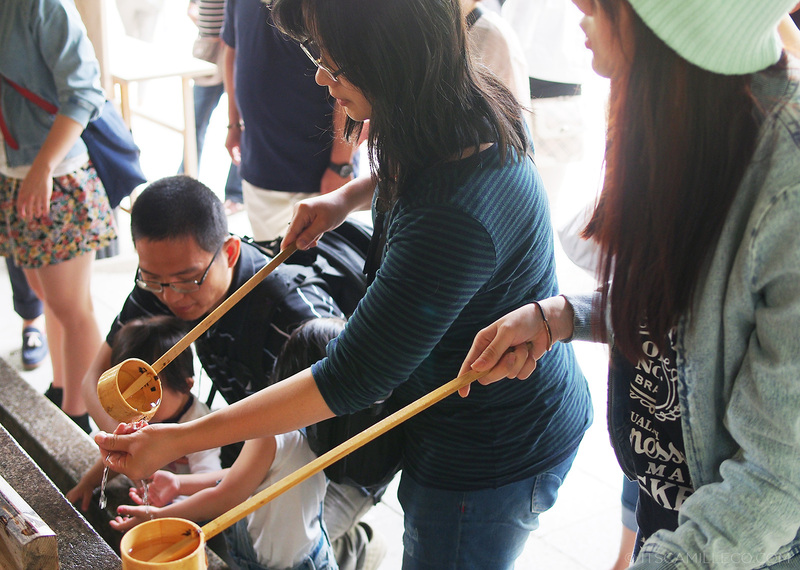 This is me observing how the other tourists and locals do it so that I can imitate them. LOL! Copycat. 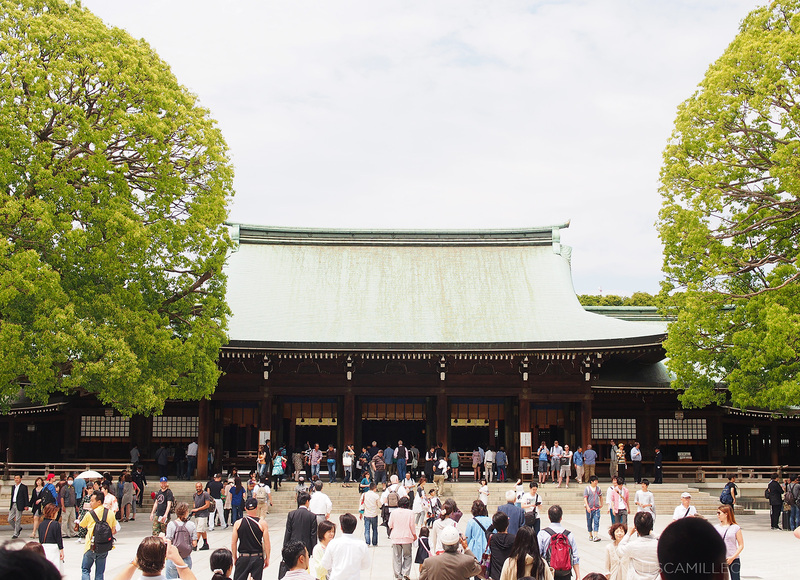 We visited the shrine on a Sunday so we were lucky to see at least 3 couples get married there. This is couple number one. 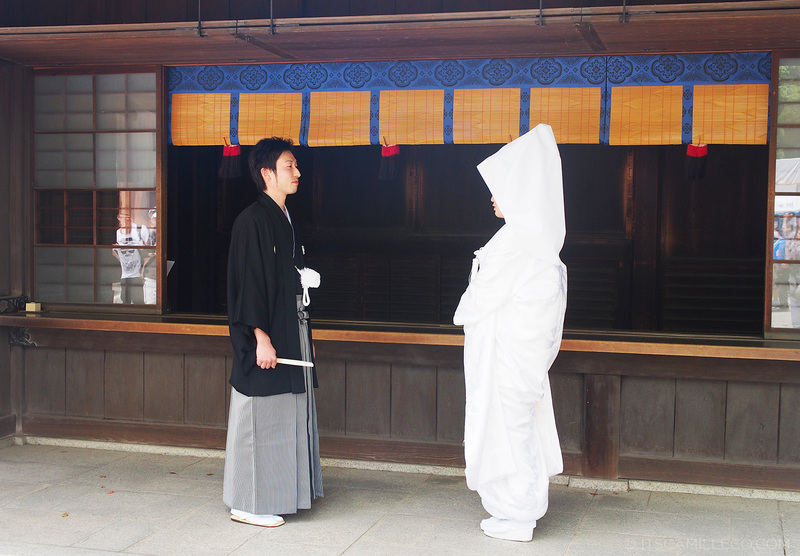 As you can see, the bride is dressed in a simple, all-white ensemble. 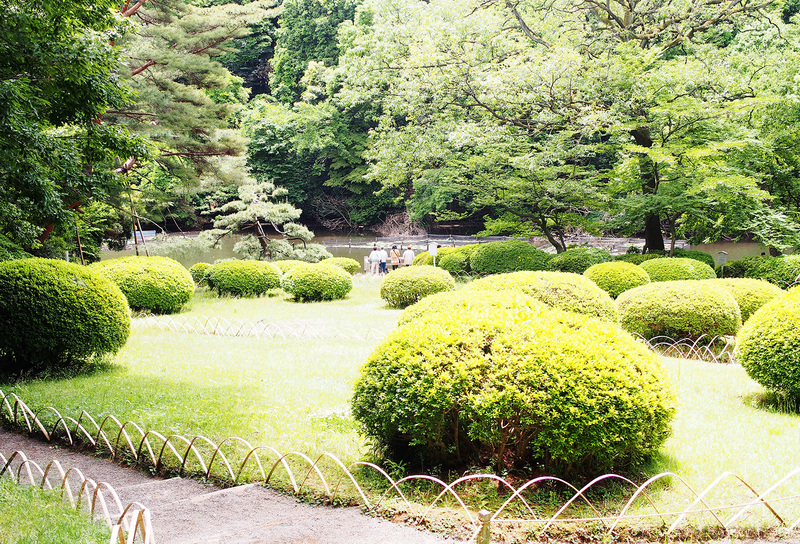 This is before the actual wedding ceremony which takes place inside one of the rooms. This is couple #2. 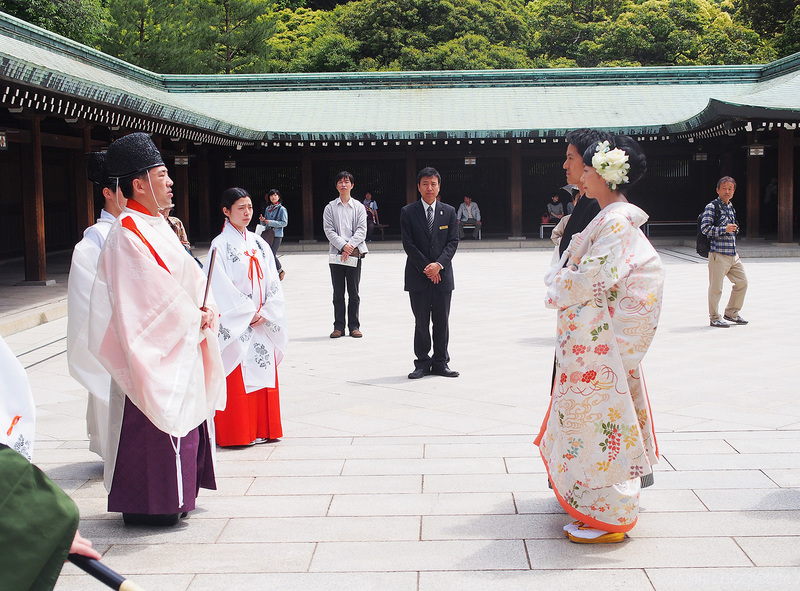 The bride is already dressed in a pretty kimono so at this point, they’ve already been pronounced husband and wife. 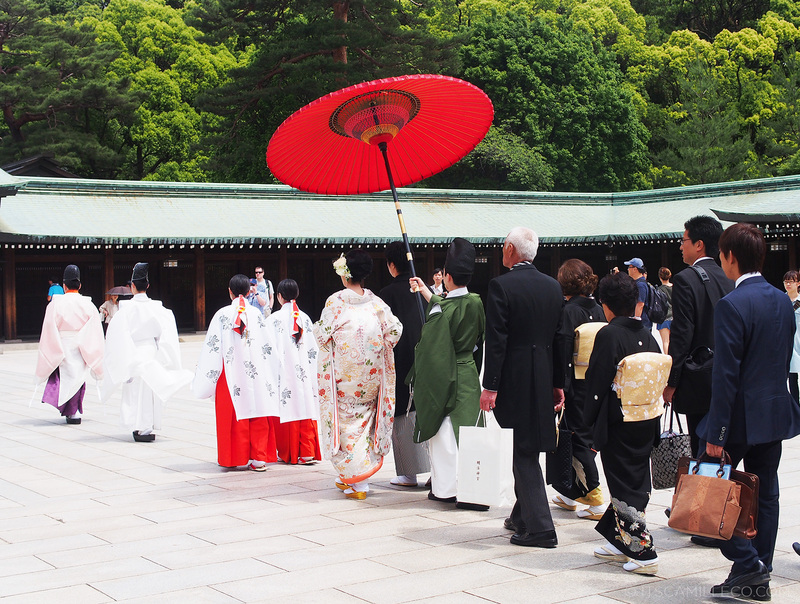 The whole bridal party marches out from the room and stops in the middle of the courtyard. And that’s about it! 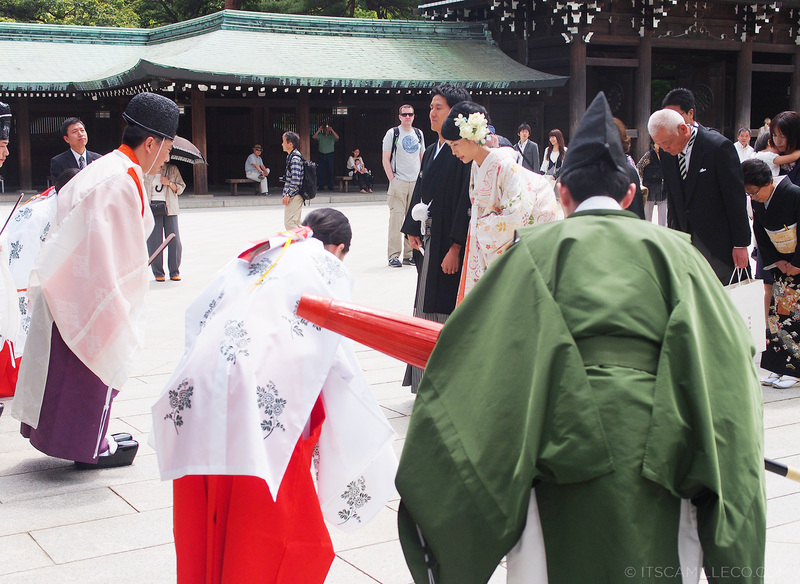 The Shinto priests bid them farewell. 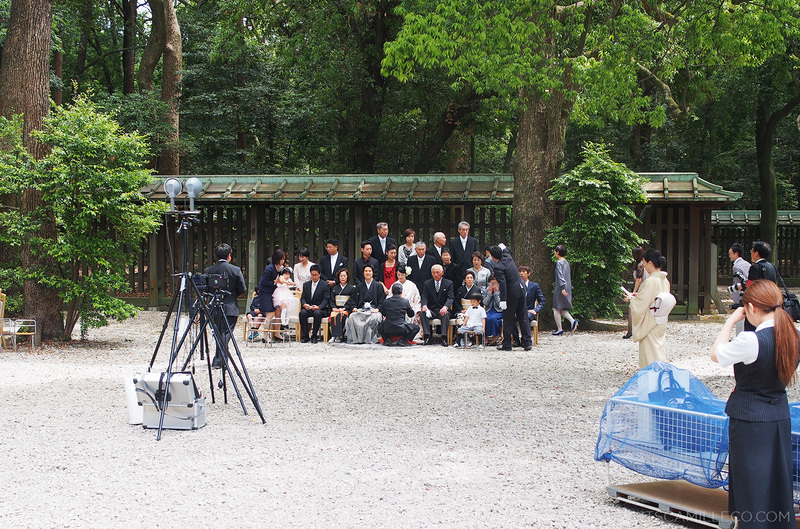 Then the couple poses for photos with their friends and relatives. I couldn’t stop staring at bride #1’s headpiece. 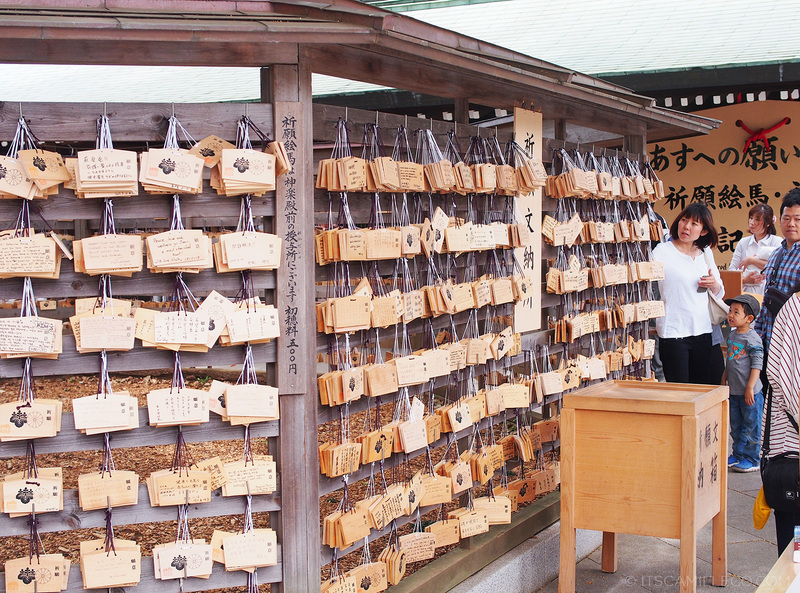 When you get to the Shrine, what the locals usually do is make a wish by tossing some yen into the offering box then bow their heads twice, clap their hands twice then bow once again. 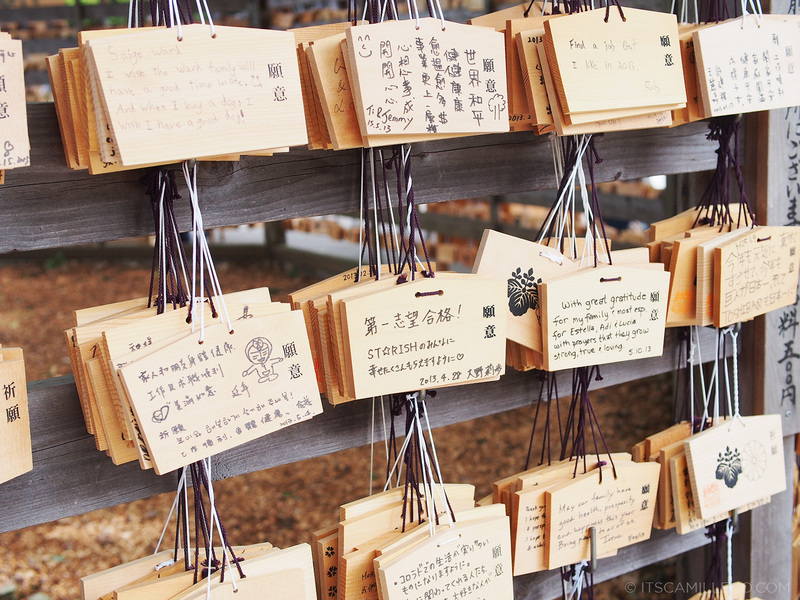 I couldn’t take photos of this because photos aren’t allowed in the Shrine but here’s a photo of the prayer wall located near it. 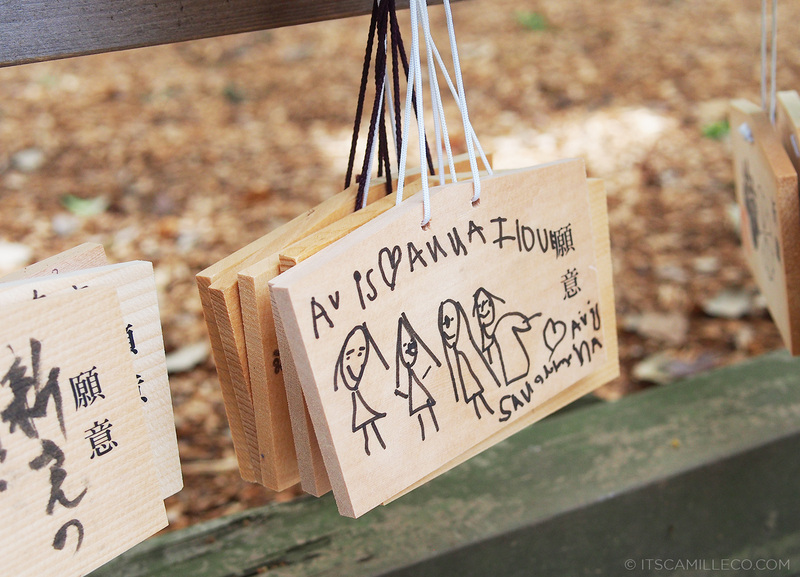 These are prayers from people who’ve visited the Shrine. You can see how diverse the people are and their concerns. It’s quite fun to read them actually. I’m guessing this one is from a little girl. This one is probably by a little boy. LOL! That’s one big problem he’s got there! 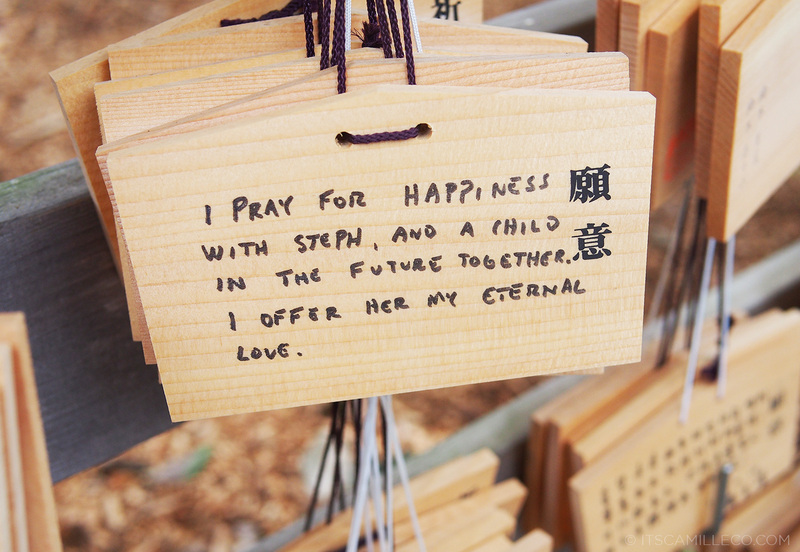 “I offer her my eternal love.” Awwwwwww, how sweet. 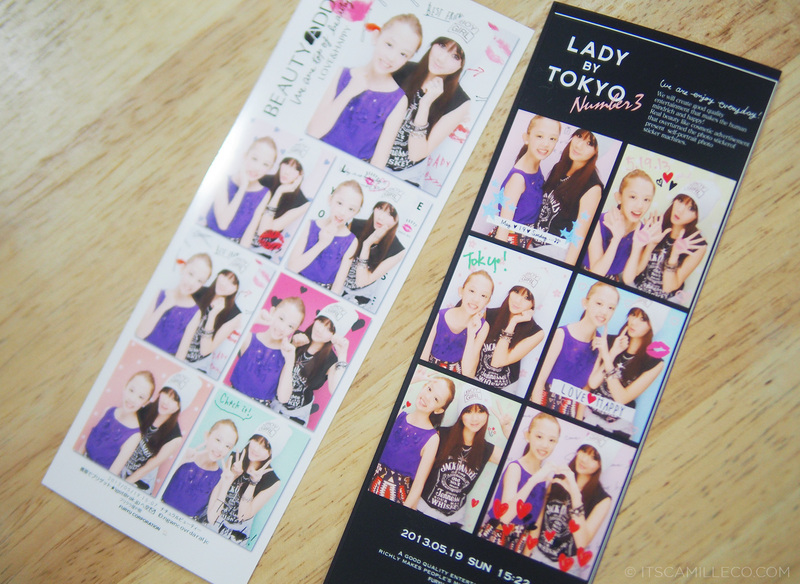 To end this post, here’s a purikura of my sister and I. I offer her my eternal love as well for taking my outfit shots! Haha! Ang dami ko nang dapat habulin sa mga entry mo. Narito pa ako sa entry na ‘to. srsly, my jaw literally dropped for about 5 secs when you said that your sister is already 27!! she looks so young and petite! 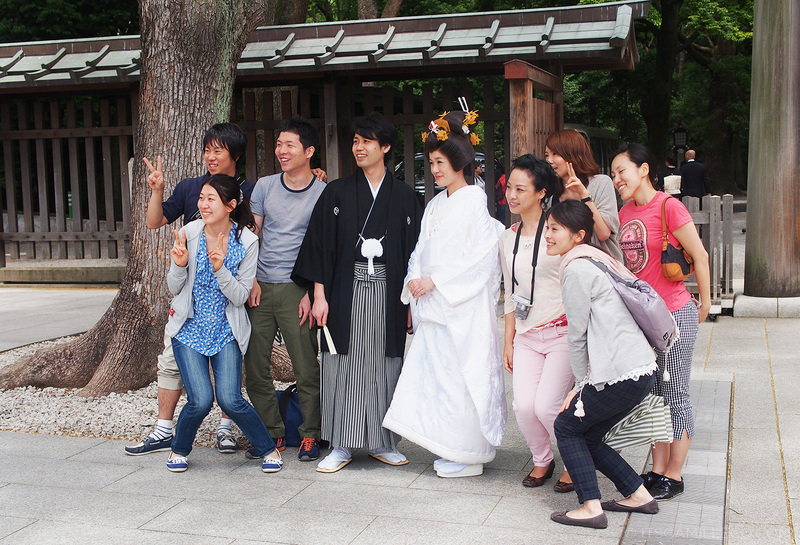 it was me who asked the kimono girls for the photo because you were shy and scared. Haha! Sweet photos! My favorite is the shot if you and your sister! Kudos for having unique styles! Both of you have a great eye for color combinations as well as prints and textures. 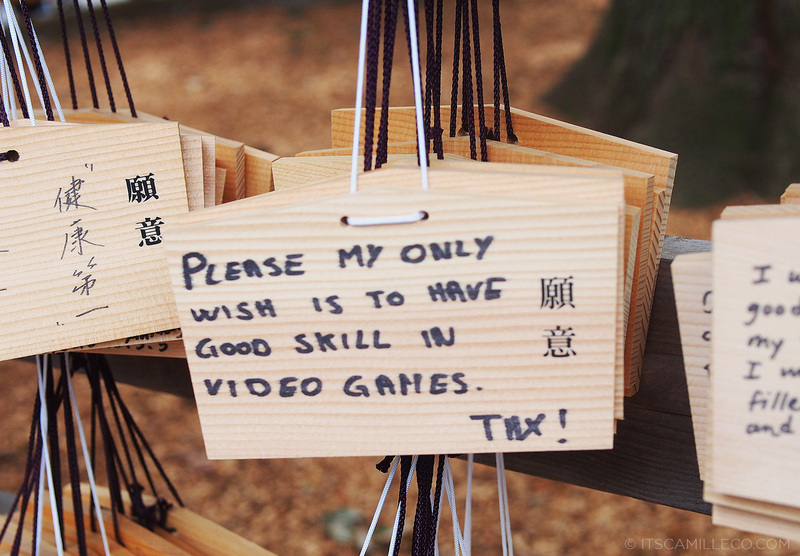 When I go to that shrine, I’ll place a prayer for you, Miss Camille! Thank you Angelic! She’s slowly learning from you LOL! :) And that’s so sweet of you! WOWWWW. I can’t believe your sister is already 27!!! Nakakaloka. hahaha. I remember this outfit. 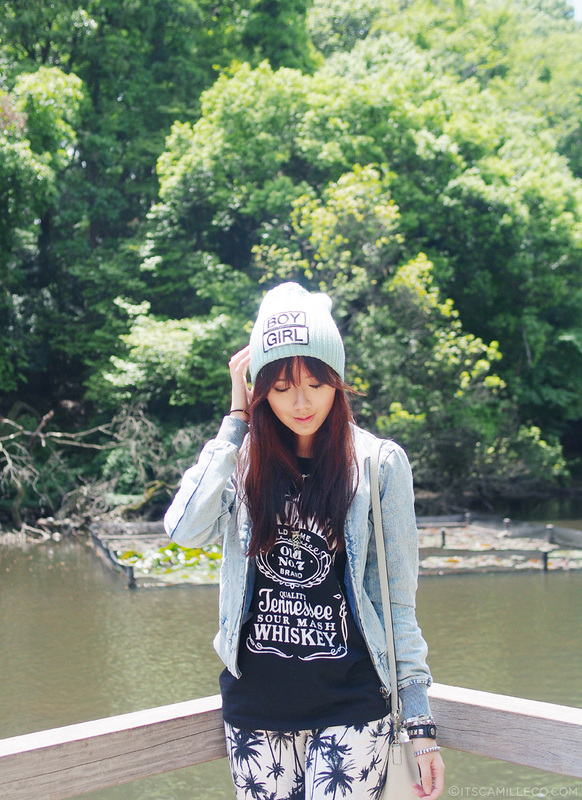 You were wearing this when I bumped into you in Takeshita Dori in Harajuku. It was so nice to meet you finally. Your sister is so cute and pretty <3! It’s the first time you showed a picture of your sister, right? I agree with everyone, she looks so young! And of course, I like what you’re wearing here as always! PS: I also finally muster up the courage to ask you about the price of celine bag. And I will be happy when you graciously tell me the worth. LOL! ohhh. wait! my first impression of your sister was she reminds of chloe ting, that i really thought she was 12 years old or something. Hahaha! You are so funny.. the photos are awesome and ur sis is co pretty. That’s such a cool jacket! The style is something I usually only see on hoodies. Ohhhh I didn’t get that LOL! :) Thanks Rae! Your sister is 27?! Bakit ganoooooon?! 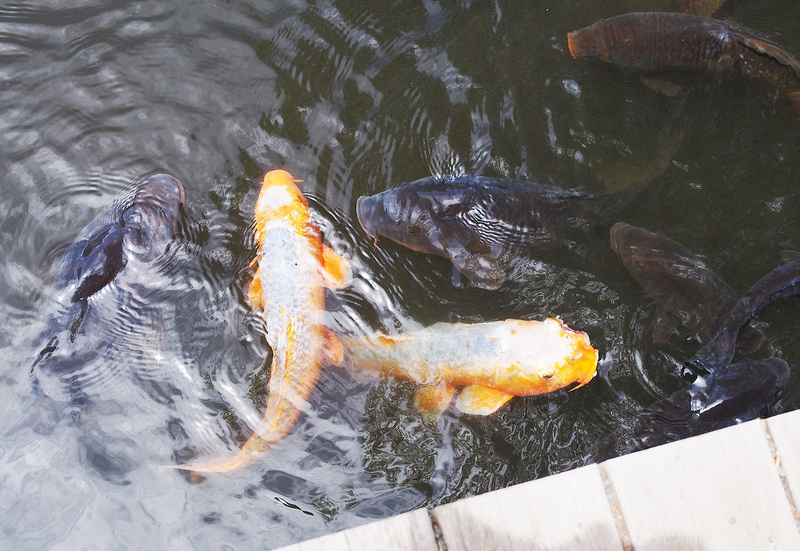 You look enjoyed in Japan !I really want to go to Japan !!! Hopefully next year !! Haha! :) Yes! That’s true! 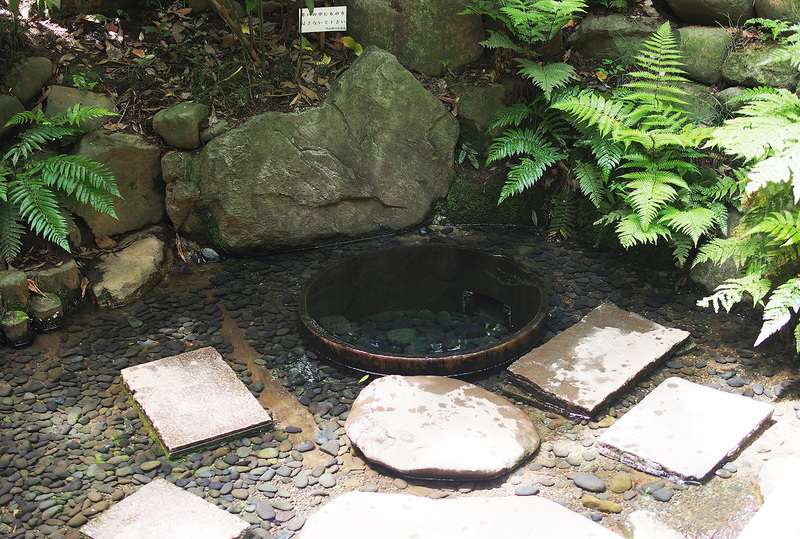 where do u stay in tokyo ? You’re sister really look younger. Hehe. Kimono! Siguro parang may shooting ng teleserye dyan everyday. 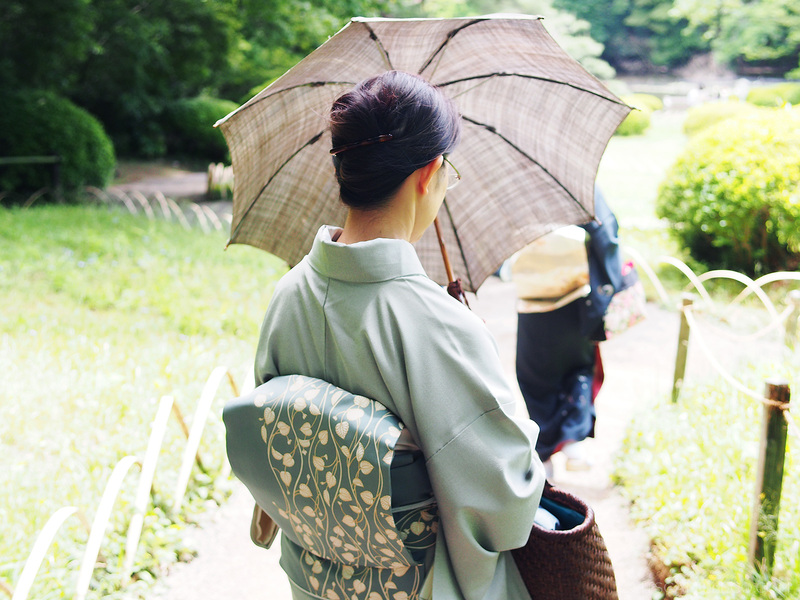 What if we are also used to wear baro’t saya here in the country? The heaaat! Oo nga! I can just imagine! 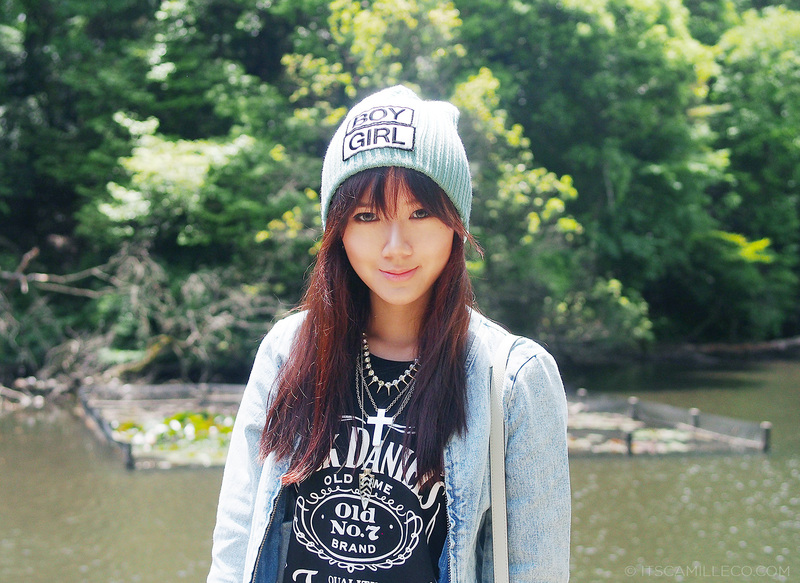 your sister looked like kim chiu… she’s very pretty too..
Nice post and photos! You look fantastic! 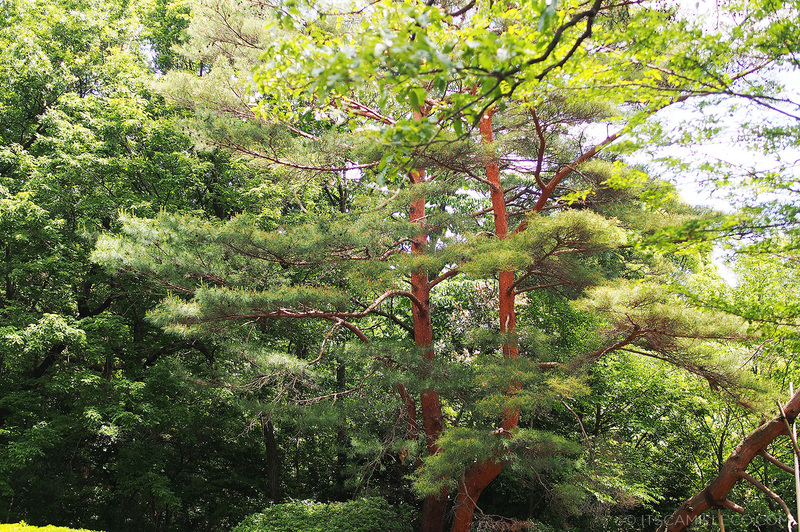 I love your blogs about your trip, makes me want to go visit Japan (someday I will). 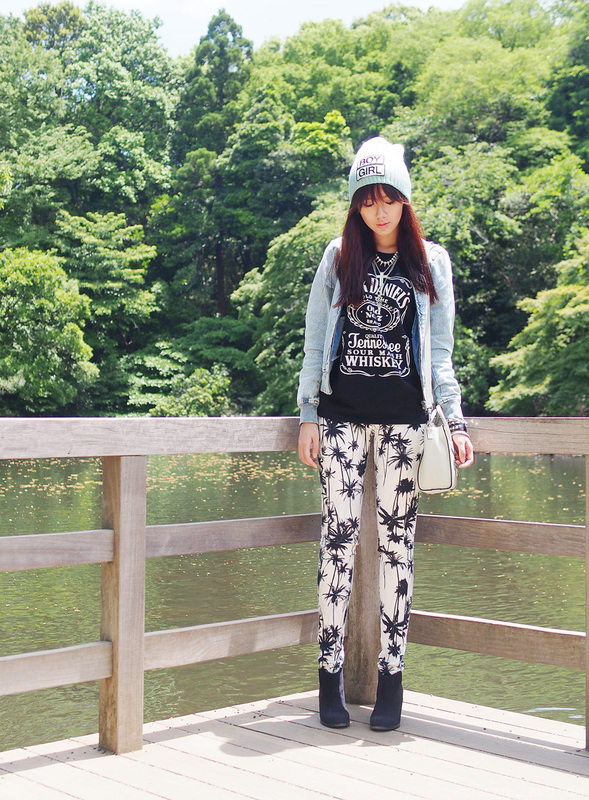 I have a question,which one do you prefer, Japanese fashion or Korean fashion? I’m just curious about your opinion, I know they are kind of the same. What exactly is the difference between the two? Thanks Paulette! I like both actually. It’s so hard to decide though. Both are so diverse as well! Nice yung outfit mo Cams! You're so versatile talaga! Thanks Reena! Hindi kasi mahilig matulog ng maaga sister ko when we were younger haha! Haha! You’re not the only one! I always die when I dont see your blog because of slow internet connection!! Im alive now! Yay! You have been resurrected! 27? Oh…. you’re messing with me Camille. Haha. She looks so young! She can even pass for a high school student. Gosh, I feel so old. Hahahaha. This post reminds me of my sister and I. We usually go out together too. BTW, I love your look here. A little rugged compared to your usual kikay outfits. Still, you rocked it! Hi Ms.Camille! I really admire the way you wear your outfits! I really wish I could meet you soon! Fan here! 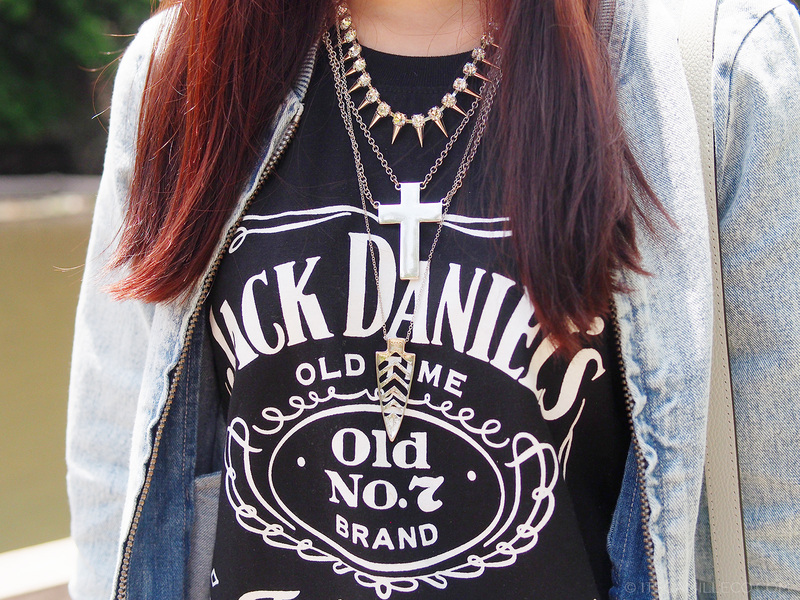 Nice Jack Daniel’s Tee btw! :) Just followed up my site. Hehe. “I offer her my eternal love as well for taking my outfit shots! Haha!” –> Love that line!! I should copy that one day so my sissy could read it and won’t get tired taking my outfit shots. Aren’t we lucky we got a sister?? Haha yes we are! Even if they make us crazy sometimes! LOL! Waaah! Your sissy doesn’t look like her age at all! Mukha syang 13! Bongga nya! Lahat tayo kulubot na ang pes…sya nagme-mens pa lang! Kainggit yung mga ganyan! Forever youthful ang aura! Tyaka mukhang inosente! Feeling ko sya ang magmamana ng cutesy outfits mo. Ganyan din ako! Laging naka-holding hands with my mom pag naglalakad! haha! Sanay na ako. People always say I look older. :) I really love caps! SUPER!